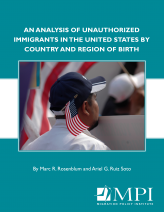 Mexican and Central American immigrants, who have long histories of migration to the United States, represent 37 percent of the U.S. foreign-born population, yet are disproportionately represented (71 percent) among the total unauthorized immigrant population. Mexico alone accounts for more than half of the estimated 11 million unauthorized immigrants in the United States, with another 15 percent and 14 percent from Central America and Asia, respectively. This report describes trends in the origins of the unauthorized population since 1990, offering estimates for top states and counties of residence by country or region of origin. It also provides estimates for how many members of each origin group are potentially eligible for the Deferred Action for Childhood Arrivals (DACA) program, finding application rates vary significantly across national origins. The report also reviews how settlement patterns vary by origin among new and more established immigration destinations. During the 1990s, the unauthorized population rose substantially, doubling from 3.5 million to 7 million. It continued to increase during the 2000s, reaching a peak of 12.2 million in 2007, then fell to 11 million during and after the recession. While Mexicans comprised a majority of unauthorized immigrants throughout these years, between 2007 and 2013 the population declined by about 1 million. In contrast, unauthorized populations from Central America, Asia, and Africa grew rapidly after 2000—with the numbers from Central America and Asia tripling and from Africa doubling. Countries significantly represented in these increases include China, Ethiopia, Ghana, Guatemala, Honduras, India, and South Korea. An accompanying interactive map allows users to determine where unauthorized immigrants from select countries and regions settle, by top state and county locations, as well as population size and eligibility to apply for relief from deportation via one of two deferred action programs launched by the Obama administration.